India was named first in the Asia-Pacific group for the category: 'Reaching the Poorest and Most Vulnerable through Inclusive Services and Participation'. First prize received by Mamata Banerjee for Kanyashree at the UN Public Service Awards. 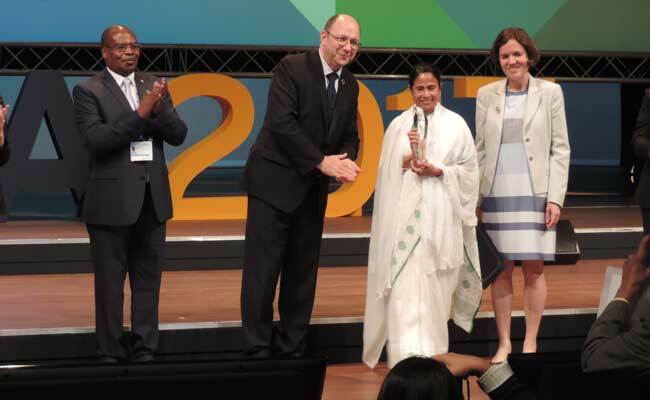 Kanyashree Prakalpa, the scheme launched by Mamata Banerjee in October 2013, two years after she became West Bengal chief minister, today won her government the United Nations Public Service Award at The Hague. The government of West Bengal was the awarded institution for Kanyashree which aims to improve status of adolescent girls from disadvantaged families through small cash transfers. "Increased educational attainment, prevention of child marriage and financial inclusion are the scheme's objectives....Kanyashree works towards creating a supportive environment in which girls are encouraged to express their full potential and are free to become architects of their own lives," the UN release said. "Kanyashree of Bengal now becomes "Kanyashree" of the world. The United Nations today, on the occasion of UN Public Service Day, awarded the United Nations Public Services first-place winner award... to Government of West Bengal for "Kanyashree", out of 552 nominations from 62 countries," Mamata Banerjee wrote on Facebook. "We are delighted on behalf of our countrymen and the people of Bengal to receive the first prize on UN Public Service Day. Receiving the first prize from the UN for Kanyashree is a huge honour and recognition," she tweeted. The winner in the Latin America-Caribbean Group was Argentina where in Santa Fe, the municipal body had launched a programme for early childhood education. In the Western Group, the winner was the UK's Avon and Somerset Constabulary which has put together a programme to prevent senior citizens from being defrauded. The Public Service Awards were launched in 2003. This year's winners were announced during the UN Public Service Forum "The Future is Now - Accelerating Public Service Innovation for Agenda 2030". This is not the first award for the Kanyashree Prakalpa. The UNICEF lauded the programme a couple of years ago.The scheme has brought 40 lakh school and college going girls under its umbrella who are given small amounts of money as scholarships as long as they continue going to school.